During the week I was watching Rick Stein’s travels through Spain again ( I really love Spanish food and could watch Rick all day, he really brings the food to life for me!) and saw him cook some fantastic prawns very simply so when I spotted some huge whole prawns at the fish counter that was my Friday dinner sorted! 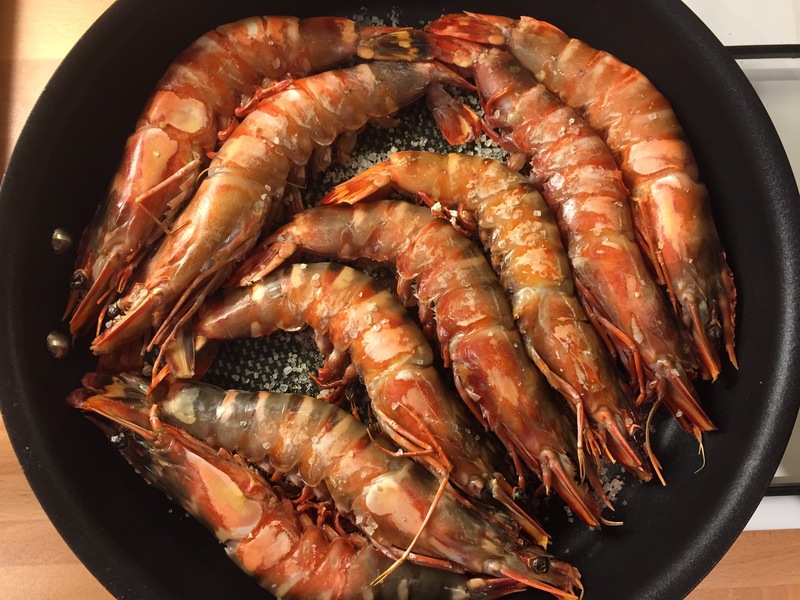 All I planned to do was get a big pan really quite hot and cook the whole prawns on a bed of sea salt till they turned a vibrant pink. 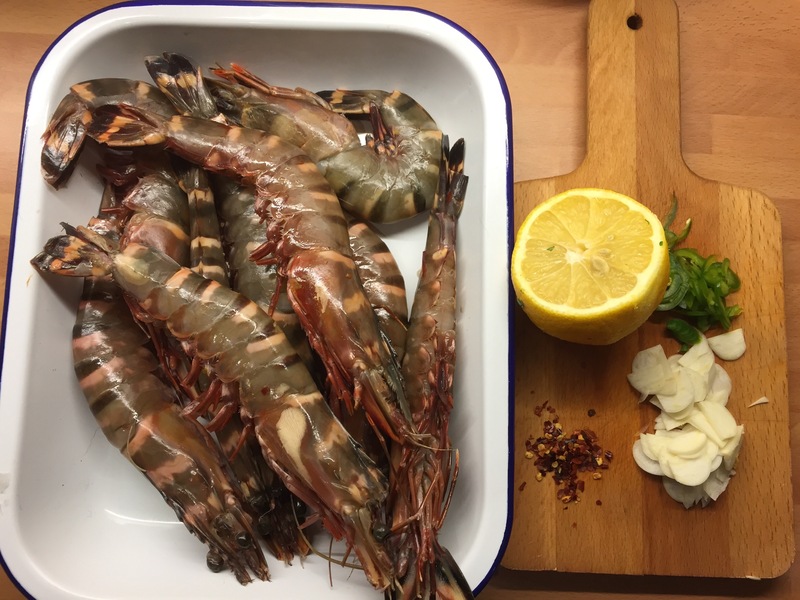 When the prawns were cooked I placed them in a serving dish, emptied the pan of salt and then made the butter ( I’m a big fan of one pot cooking) . I sautéed the fresh green chilli, lemon zest, garlic and dried chilli for a couple of minutes then added a large knob of butter, a handful of parsley and some lemon juice. The prawns were so moist and cooking them in the shell really adds to the flavour. The butter was great and using the dried and fresh chilli gave a great depth of heat without being overpowering. Perfect Friday night food, although a finger bowl was required! 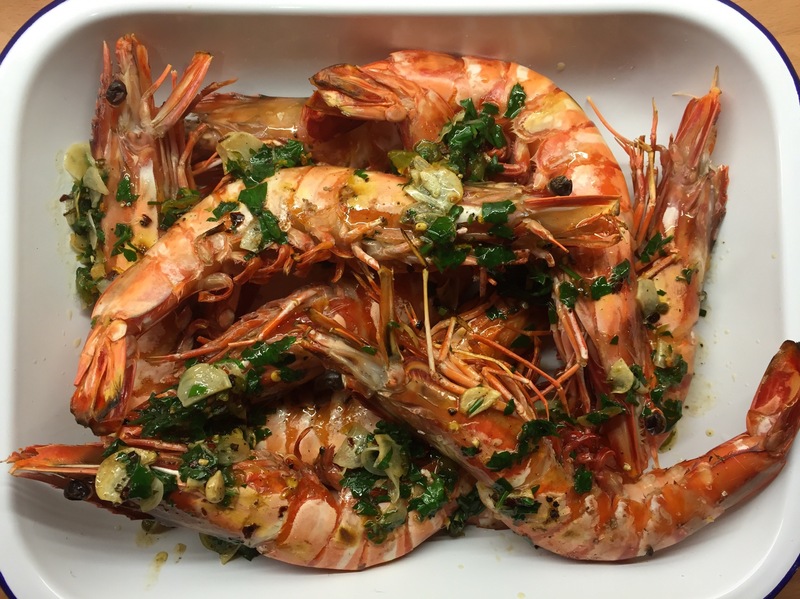 Prawns are probably my favourite seafood and these one’s look delicious! I really like the simple preparation (I think this always works best for prawns) and it’s hard to go wrong with butter, chilli and garlic. But if you’re home, the fingerbowl can just be the sink. That sounds really excellent, though I haven’t seen prawns that big around here since Christmastime. What great flavors, though. Thanks Mary. Very true about the finger bowl, that or my t shirt! Had something just like this last year in Spain, these look just as good if not better! omg. my mouth is watering. They were pretty good even if I do say so myself! Heavenly and made with care clearly. We live in Gibraltar now, so we’re lucky enough to be able to wonder into spain for good seafood. The fish and shellfish at the markets is one of my greatest delights! 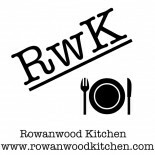 I will keep following to see more of your beautiful food. Thanks Laura Kate. I’m a massive seafood fan so am quite jealous of your location! I was in Gib last year, great place to live! These look superb! Plain and simple and totally yum. These look awesome! Simple shrimp/prawns, but with just the right savory seasoning. This entry was posted on April 25, 2015 by paulb in Fish, Uncategorized.